For this special occasion, part of the HART team including Baroness Cox is travelling to Nagorno-Karabakh in September. We would like to welcome any supporters to travel with us who want to see first-hand this remarkable project and visit the beautiful lands of Nagorno-Karabakh and Armenia. 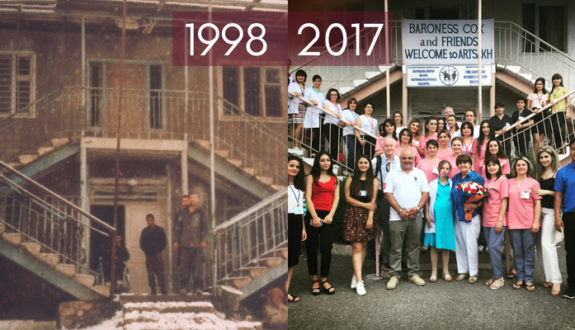 Since 1998, the Director of the Centre, Vardan Tadevosyan, has worked tirelessly to turn a bombed-out building into an internationally recognised ‘Centre of Excellence’ to support people living with disabilities in the region. The centre now treats over 1000 patients a year, extending their services to reach even more marginalised people by training regional nurses in their outreach programme. There is a huge variety of treatments offered, from physiotherapy and psychology sessions to hydrotherapy and occupational therapy. In May 2017, a new Autism Day Care department opened for children aged 2-16. They receive high-quality care receiving special education and therapies from specialist nurses. During the visit, you will be able to take part in the celebrations, get a guided tour from the director, Vardan Tadevosyan, and meet the patients whose lives have been enhanced by the Centre. We would love to share this experience with you. If you are interested, please be in touch with our office to discuss the itinerary. Email office@hart-uk.org or call 020 8205 4608.